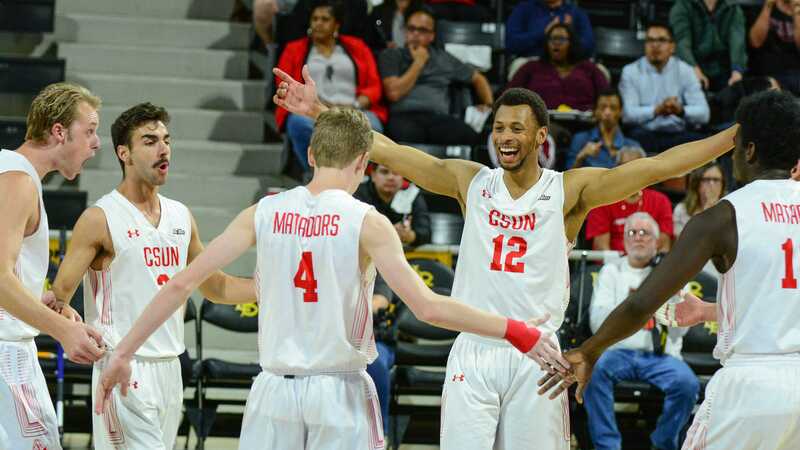 The Matadors defeated the UCSB Gauchos in a very unpredictable match Thursday night to advance to the second round of the Big West Tournament. CSUN defeated UCSB with scores of (25-18, 30-28, 12-25 and 28-26). CSUN remained in control from the get-go of the first set starting with a 3-0 run. The Matadors slowly pulled away and won the first set. The Gauchos battled back hard in the second with their own 3-0 start and each team pushed the other to the brink. CSUN handed the game to the Gauchos late in the set with three consecutive service errors. The Gauchos would not take it allowing the Matadors to score three unanswered points to win the set following a Gaucho match point. The third set had little to do with the first two as UCSB came out booming while the Matadors looked lethargic. The Gauchos took a nine to one lead to force coach Jeff Campbell’s final timeout early in the set. Eventually five starters were pulled (everyone except libero Emmett Enriques) and subs came in to attempt to save a lost set. CSUN dropped one of their worst sets of the year only registering 13 points. Outside hitter Dimitar Kalchev was one starter pulled after his hot start quickly diminished. CSUN’s Bulgarian baller registered 14 kills on a .455 hitting percentage in the first two sets alone. This was a terrific bounce back performance through two sets for Kalchev who has struggled in Big West play as he only hit .137 in conference games. Kalchev finished the game with 15 kills while hitting .171. The starters re-entered the game rejuvenated in the fourth as the Gauchos were still playing as if the first two sets never happened. The fourth set had several lead changes and was very back and fourth. A pair of Arvis Greene kills would abruptly end UCSB’s season and push CSUN’s to at least one more day. Greene finished with a team-high 20 kills. “[The only thing] I want to see different tomorrow is intensity, to start off strong.” Greene said. CSUN will now advance to the semifinals to play the hosting Long Beach State. Long Beach comes in after suffering their first loss of the season following 24 straight wins. CSUN is yet to take a set against Long Beach this season but is playing much more consistent volleyball than when the two first met this season. A win for CSUN would arguably be the biggest upset of the year.